I have a soft spot for crafts that involve using the kids’ fingerprints or handprints. Mother’s Day is a great time to make something that captures the memories of the kids at this age through fingerprints. 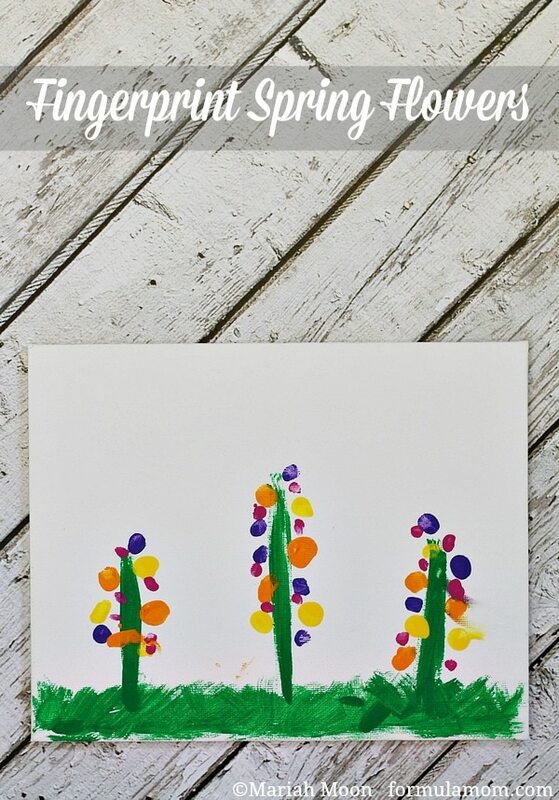 So I got both of the kids involved in making this Spring Fingerprint Flowers on canvas for Mother’s Day gifts this year! What I love about fingerprint projects is that they can be done on so many different surfaces. You can turn them into cards by using cardstock or make them on canvas for some festive artwork to decorate the house. You can also decorate a vase or a picture frame. So while we made our fingerprint flowers on canvas, you could do this project on almost any surface you chose! 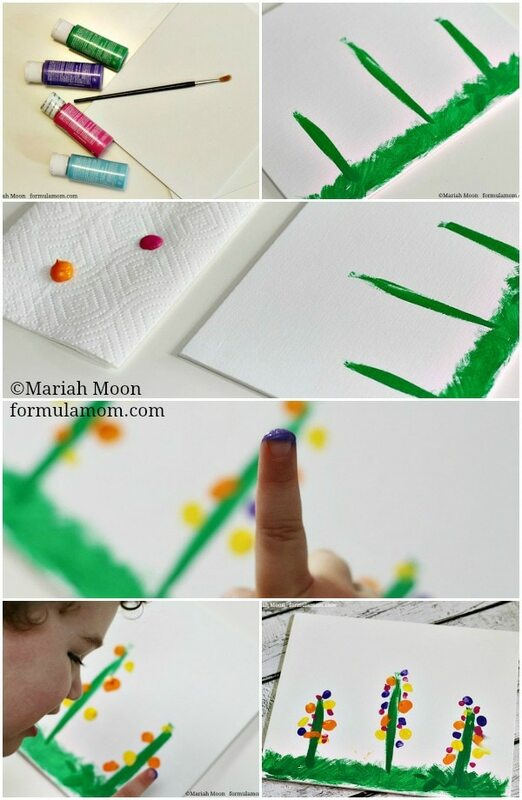 Use the paint brush to paint grass and flower stems on the canvas. If your child is old enough they can do this part. If you’re making this project with younger kids, you can complete this step before working with the kids. The paint dried quickly enough that I painted the grass while W was at the table with me. Squeeze dots of paint onto a paper towel or paper plate to make clean up easier. 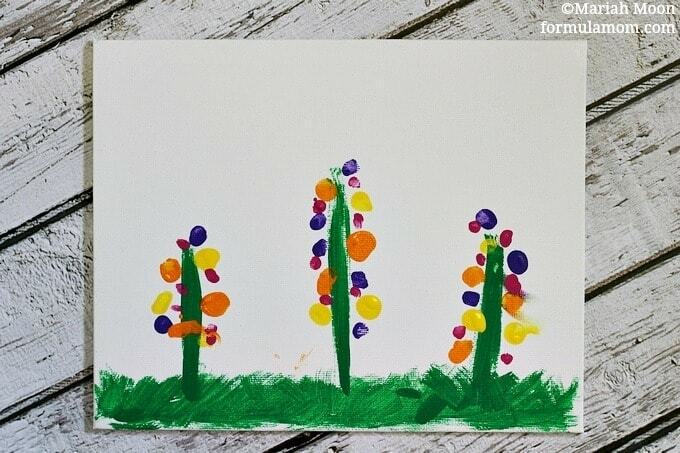 Have child use one color at a time to make dots along the stems with their fingertip. Clean finger off and repeat with the next color. Once paint has dried you can add a label with the label or names. Our canvas pieces have a label on the back where I am able to fill in all of the information about when we made the project and which of the kids made it. I have a feeling this will be a hit with all of the grandmothers! I am buying Grambo a picture frame/cookbook stand (affiliate link to the one I purchased) so she can display the art the kids create in her bedroom or on her desk at work! This is bound to be one of her favorites because she loves flowers (and her grandkids, of course)! Who in your life would love the gift of fingerprint flowers? « Summer Outdoor Toys for Toddlers You Have to Have! This is such a cute idea! I’m pretty sure my mom would love this from my little boy! Thanks for the cute craft! 🙂 Your twitter account came up as a recommended follow, and I’m loving your blog so far!